Here is the location of gold fields and gold mining in Western Australia which will help you find the best places to metal detect in this state to find gold. Left Click on the picture to obtain a more readable PDF file of the gold fields and gold occurrences Map of WA that you can print. Its also very handy to know the production of the area and whether it was from crushed ore or alluvial gold. This helps when you are looking for "patterns" to prospect for gold or finding metal detecting localities. ... and may be now after millions of years of geological upheavals in the locality. The sites of old gold mines, dryblowing areas and mining areas can help you quickly outline areas to target and area search patterns to use to find that Virgin Gold Nugget patch. 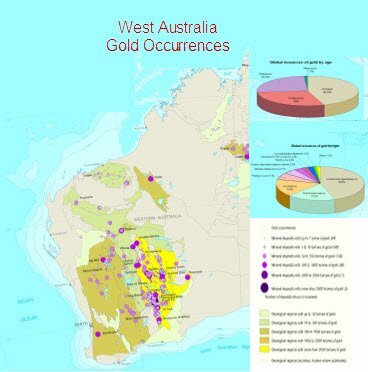 There are a few research resources that can help you find out where the historical and current gold fields of Western Australia that are outlined on other pages in the site. Some easy instructions how you use Minedex in Tengraph Online are provided at this link. Simple Graphical Tengraph On line Instructions to find Abandoned Gold Fields Data. These maps are an excellent resource for research and you can obtain them electronically for free - see our page about	geological maps. We are currently rewriting that book so it is use able AND IT WILL INCLUDE GPS data. Currently it is unuseable electronically and does not have GPS locations included. The value of this book is that it includes old gold mine names, type of production, tonnage crushed and gold ounces recovered - a great historical document.